I used to have a high-heeled shoe problem. But now that I can barely walk in flats, let alone heels, my shoe love has migrated to the running kind. 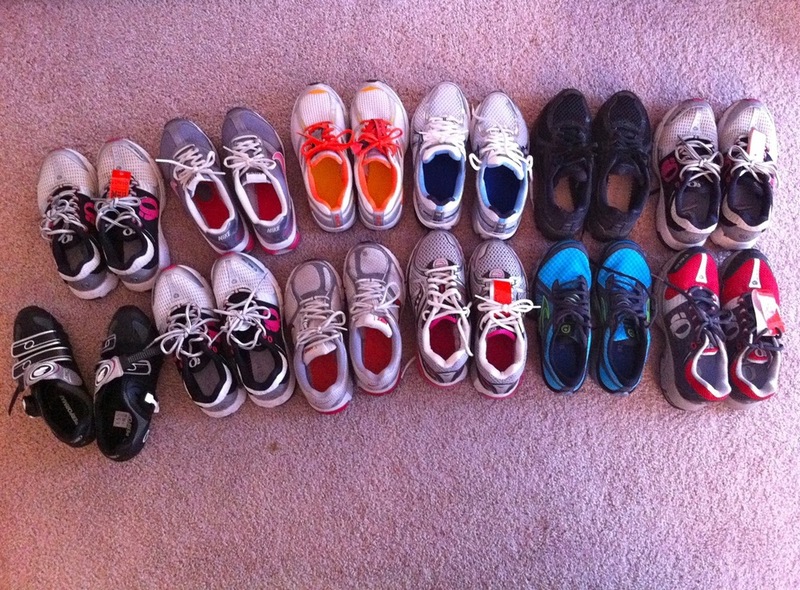 Each one of these shoes holds a special place in my heart. From the 4 pairs of Pearl Izumi syncroFuel's (including 1 pair of the trail version), to the Nike Zoom Triax's, the shoes I ran my first marathon in. Most recently I have returned to running in Brooks - the very first shoe I started running in back in 2004. I can't remember what model that first shoe was but right now it's the Brooks Adrenaline. A few months ago I was meandering around Road Runner Sports and the sales guy had me try on the Adrenalines. They felt pretty good so I got a pair. I thought it would be cool to get a pair of black shoes since all the other shoes I had at the time were white-based. The thing is, black shoes only look good with black socks. They look pretty dumb with white socks, and I only have 2 pairs of black socks. Luckily, I run at 6 am when there aren't very many people out and I don't care what I look like at that ungodly hour of the morning. With the black Adrenalines accumulating miles, and CIM a little more than 6 weeks away, I figured that now would be the time to start breaking in a new pair for race day. So I ordered a second pair of them (white and blue this time), which I used for the first time this morning. They felt really good and I think they won't take as long to break in as the black ones did. I still plan on rotating the other shoes into the mix (only 2 pairs are at retirement mileage), but the Adrenalines are the ones I'll mostly use for the next month and a half.